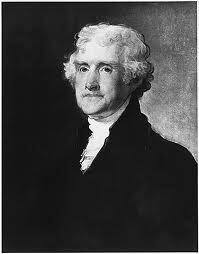 Thomas Jefferson delivered his first inaugural address on March 4, 1801. The speech, was, and still is, considered highly symbolic, as it marked the first transfer of executive branch power from one party to the other. The speech itself, with its calls for national unity and an express tolerance of criticism and dissent, is considered to be a hallmark declaration of democratic principles and republicanism. A commitment to the protection of legally guaranteed basic civil rights. Jefferson closed his address with a plea for adherence to such principles in order to ward off the encroachment of tyranny and repression, and guarantee peace, prosperity, and liberty. Jefferson’s apologists may never grasp the paradox at the heart of these words with enough conviction to eliminate the fundamental conflict that these words set loose upon society. They are the fundamental core of the American Dream, and it must always be remembered that America’s idealism, is and always will be a paradox. It is called the American Dream because Jefferson set forth a high ideal which few people and few lawmakers can achieve with regularity. But Jefferson also set the bar high so that as a people America will strive for those ideals, regardless of how lofty and philosophical they seem. The reality of America is one of daily injustice: Jefferson held slaves, and ignored the disenfranchised of his day. Today, we still have gross inadequacies in our society, with huge gaps between the haves and the have-nots. It is not a paradox to believe that every human should have equal rights and equal opportunities. In setting down these words, Jefferson ensured that America as a nation would at least attempt to uphold them. Thomas Jefferson and Alexander Hamilton were not only two of most powerful and influential of the founding fathers, but in many ways the two represent the polar differences that led to the development of the Democrat and Republican parties. Jefferson, as a farmer, stood in direct opposition to Hamilton’s desire to create a national banking system in concert with an American economy that was manufacturing-based rather than agriculturally based. In partnership with this specific difference was a greater philosophical difference that found Jefferson wanting more power in the hands of the common man, while Hamilton eyed a more aristocratic elite that would act as overseers of the common man. It is not hard to see how Jefferson’s ideals developed into the contemporary Democratic Party and how Hamilton’s views developed into the Republicans. Jefferson’s support of the rights of the common man were clearly at odds with Hamilton’s over the French Revolution, at least at the beginning. George Washington stood philosophically between these men and his reaction was one of neutrality. However, this neutrality probably had more to do with Washington’s outrage over the violent offenses being committed, and by the desire to keep the US from being dragged into a war between France and England than it had to do with any political philosophy. Jeffersonian Economic Model research papers examine Jefferson's economic vision of the United States based on the triumph of the yeoman farmer. Paper Masters writes custom research papers on Thomas Jefferson and discuss how he delivered his first inaugural address on March 4, 1801.